Assyria is located in north Mesopotamia and spans four countries: In Syria it extends west to the Euphrates river; in Turkey it extends north to Harran, Edessa, Diyarbakir, and Lake Van; in Iran it extends east to Lake Urmi, and in Iraq it extends to about 100 miles south of Kirkuk. This is the Assyrian heartland, from which so much of the ancient Near East came to be controlled. Two great rivers run through Assyria, the Tigris and the Euhprates, and many lesser ones, the most important of which being the Upper Zab and Lower Zab, both tributaries to the Tigris. Strategically surrounding the Tigris and the two Zabs are the Assyrian cities of Nineveh, Ashur, Arbel, Nimrod and Arrapkha. To the north and east of Assyria lie the Taurus and Zagros mountains. To the west and south lies a great, low limestone plateau. At the southern end of Assyria the gravel plains give way to alluvium deposited by the Tigris, and farther south there is insufficient rainfall for agriculture without irrigation. These two features create a geogrpahical boundary between Assyria and the neighboring land to the south. The Assyrian land is rich and fertile, with growing fields found in every region. Two large areas comprise the Assyrian breadbasket: the Arbel plain and the Nineveh plain. To this day these areas remain critical crop producers. This is from where Assyria derived her strength, as it could feed a large population of professionals and craftsmen, which allowed it to expand and advance the art of civilization. Assyrians are a Semitic peoples indigenous to Mesopotamia. They are Mediterranean Caucasoids, and are ethnically distinct from Arabs and Jews. Assyrians have used two languages throughout their history: ancient Assyrian (Akkadian), and Modern Assyrian (neo-syriac). Akkadian was written with the cuneiform writing system, on clay tablets, and was in use from the beginning to about 750 B.C.. By 750 B.C., a new way of writing, on parchment, leather, or papyrus, was developed, and the people who brought this method of writing with them, the Arameans, would eventually see their language, Aramaic, supplant Ancient Assyrian because of the technological breakthrough in writing. Aramaic was made the second official language of the Assyrian empire in 752 B.C. Although Assyrians switched to Aramaic, it was not wholesale transplantation. The brand of Aramaic that Assyrians spoke was, and is, heavily infused with Akkadian words, so much so that scholars refer to it as Assyrian Aramaic. Assyrians have practiced two religions throughout their history: Ashurism and Christianity. Ashurism was, of course, the first religion of the Assyrians. The very word Assyrian, in its Latin form, derives from the name of Ashur, the Assyrian god. Assyrians continued to practice Ashurism until 256 A.D, although by that time, most Assyrians had accepted Christianity. Indeed, Assyrians were the first nation to accept Christianity, and the Assyrian Church was founded in 33 A.D. by Thomas, Bortholemew and Thaddeus. Emergence: Beginnings To 2400 B.C. First Golden Age: 2400 B.C. to 612 B.C. First Dark Age: 612 B.C. to 33 A.D.
Second Golden Age: 33 A.D. to 1300 A.D.
Second Dark Age: 1300 A.D. to 1918 A.D. In 1932, Sir Max Mallowan, the eminent British archaeologist, dug a deep sounding which reached virgin soil ninety feet below the top of the mound of Nineveh; this gave a pottery sequence back to prehistoric times and showed that the site was already inhabited by 5000 B.C.. Very soon after that, the two other great Assyrian cities were settled, Ashur and Arbel, although an exact date has yet to be determined. Arbel is the oldest extant city, and remains largely unexcavated, its archaeological treasures waiting to be discovered. The same holds for Ashur. It is clear that by 2500 B.C., these three cities were well established and were thriving metropoli. This period of history saw the development of the fundamentals of our civilization: animal domestication, agriculture, pottery, controllable fire (kilns), smelting, to name but a few. As regards Assyrians, because of it rich corn fields, Arbel was one of the very earliest permanent agricultural settlements. Between 4500 and 2400 B.C., complex societies appear in the form of cities, with craft specialization and writing. These features were associated with the Sumerians, but they quickly spread to other parts of Mesopotamia, including Assyria. In Assyria, settlements had become large and guarded by fortifications walls, which implies the risk of attack from outside, and hence the need for defense and warfare. We enter into an extremely fruitful period in Assyrian History. This period would see 1800 years of Assyrian hegemony over Mesopotamia, beginning with Sargon of Akkad in 2371 B.C. and ending with the tragic fall of Nineveh in 612 B.C. Sargon of Akkad established his kingdom in 2371 B.C., becoming the first king to assert control outside of his city-state. His model would be followed by all succeeding empires, down to our times. From his base at Akkad, south of Baghdad, Sargon would come to control territories stretching north to Ashur and west to the Mediterranean. Shamshi-Adad I would establish his kingdom in 1813 B.C. Shamshi-Adad forever united the three cities of Ashur, Nineveh and Arbel into one cohesive unit, and brought Arrapkha firmly into the Assyrian sphere, so that henceforth these four cities, and Nimrod, would constitute the very core of Assyria. Under Shamshi-Adad I, the long established Assyrian merchant colonies of Cappadocia saw renewed activity. Shamshi-Adad accomplished this through his administrative efficiency and political skill. In 1472 B.C. or there about, a Mittanian king annexed Assyria, and this lasted for about 70 years. Mittanian control was decisively thrown off by about 1365 B.C. by Ashuruballit, who laid the foundation of the first Assyrian empire. Invaders from the Taurus mountains, north of Assyria, posed a significant threat to Assyria, and occupied Arik-den-ili for a number of years, but were successfully repelled, paving the way for Adad-narari (1307 B.C.) to establish the first Assyrian empire, which lasted until approximately 1248 B.C. A new power from south-west Iran, the Elamites, would assert control over Babylon for 30 years. This affected Assyria slightly. The death of Ashurdan in 1135 B.C. brough instability as his two sons vyed for the crown. Their terms only lasted one year, and Ashur-resh-ishi I ascended to the thrown in 1133 B.C. 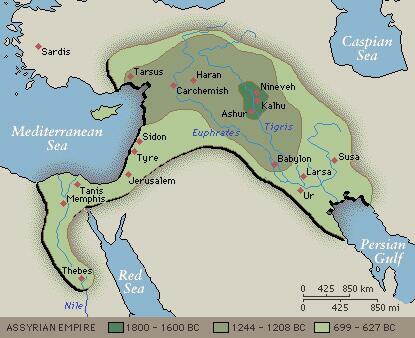 The Middle Assyrian empire began in 1307 B.C. with Tiglath-Pileser, who greatly expanded Assyrian territory. It is also during his reign that a significant development occurs, that of the Aramean migrations into Assyria. This would have a profound impact on Assyria and Assyrians, as we shall see. Tiglath-Pileser states "I crossed the Euphrates twenty eight times...in pursuit of the Arameans." This would ultimately prove unsuccessful. Tiglath-Pileser was not only a military man, but also a sportsman. Upon reaching the Mediterranean, he took the time, he tells us, to go dolphin hunting. He also established several zoos in Assyria, as he had a fascination with foreign animals. The Aramean problem persisted during the reign of Tiglath-Pileser's successor and son, Ashur-bel-kala 1074-1057), who tells us that the Arameans were penetrating deep into Assyrian territory, including Tur Abdin, Harran and Khabur. For the next century Assyria declined, the Aramean disruptions being the principal cause. It was not until 934 B.C., by which time the Arameans had settled into stable kingdoms in Mesopotamia, that Assyria would reemerge. Ashur-dan II would concentrate on rebuilding Assyria within its natural borders, from Tur Abdin to the foothills beyond Arbel. He built government offices in all provinces, and as an economic boost, provided ploughs throughout the land, which yielded record grain production. He was followed by four able kings, who used the foundation which he had laid to make Assyria the major world power of its time. The four Kings that followed Ashur-dan II were Adad-nerari II (his son), Tukulti-Ninurta II, Ashur-nasir-pal II, and Shalmaneser III. Adad-nerari would provide the final solution to the Aramean problem. He defeated the paramount Aramean chief at Nisibin and, marching up and down the Khabur, he obtained formal submissions from a series of Aramean controlled cities. Ashur-nasir-pal II would bring under Assyrian control the area from south Lebanon to the Zagros mountains, with loose control over the Taurus region. Diyarbekr was under direct Assyrian control. We come now to the beginning of greatest expansion of the Assyian empire with Tiglath-Pileser III (745-727); through a series of able kings, Sargon II, Sennacherib, Esarhaddon, Ashurbnaipal, Assyria would extend its rule over a vast area, from Egypt up to cyprus to the west, through Anatolia, to the Caspian in the east. The Assyrian empires, particularly the third one, had a profound and lasting impact on the Near East. Before Assyrian hegemony would come to an end, the Assyrians would bring the highest civilization to the then known world. From the Caspian to Cyprus, from Anatolia to Egypt, Assyrian imperial expansion would bring into the Assyrian sphere nomadic and barbaric communities, and would bestow the gift of civilization upon them. And though today we are far removed from that time, some of our most basic and fundamental devices of daily survival, to which we have become so accustomed that we cannot conceive of life without them, originated in Assyria. One cannot imagine leaving his home without locking the door; it is in Assyria where locks and keys were first used. One cannot survive in this world without knowing the time; it is in Assyria that the sexagesimal system of keeping time was developed. One cannot imagine driving without paved roads; it is in Assyria where paved roads were first used. And the list goes on, including the first postal system, the first use of iron, the first magnifying glasses, the first libraries, the first plumbing and flush toilets, the first electric batteries, the first guitars, the first aqueducts, the first arch, and on and on. But it is not only things that originated in Assyria, it is also ideas, ideas that would shape the world to come. It is the idea, for example, of imperial administration, of dividing the land into territories administered by local governors who report to the central authority, the King of Assyria. This fundamental model of administration has survived to this day, as can be seen in America's federal-state system. It is in Assyria where the mythological foundation of the old and new testament is found. It is here that the story of the flood originates, 2000 years before the old testament is written. It is here that the first epic is written, the Epic of Gilgamesh, with its universal and timeless theme of the struggle and purpose of humanity. It is here that civilization itself is developed and handed down to future generations. It is here where the first steps in the cultural unification of the Middle East are taken by bringing under Assyrian rule the diverse groups in the area, from Iran to Egypt, breaking down ethnic and national barriers and preparing the way for the cultural unification which facilitated the subsequent spread of Hellenism, Judaism, Christianity and Islam. The Assyrian empire collapsed in 612 B.C. The Assyrian people survived the loss of their state, and they remained mostly inconspicuous for the next 600 years. The Persians mention employing Assyrians as troops, and there is the failed attempt at reestablishing an Assyrian Kingdom in 350 B.C. ; the Persians squelched this attempt and castrated 400 Assyrian leaders as punishment. Assyrians continued living in their homeland throughout this dark age, until that momentous moment in human history, when the Lord Son of God gave himself for the salvation of mankind. Very soon after the crucifixion, the bulk of the Assyrian population converted to Christianity, although there remained to be Ashurites, until 256 A.D. It was the Apostle Thomas, with Thaddeus and Bartholomew who came to the Assyrian city of Edessa and founded the Assyrian Church of the East, the first and oldest church in the world. Armed with the word of God, and after 600 years of dormancy, the Assyrians once again set out to build an empire, not a military empire, but a religious empire founded on divine revelation and Christian brotherhood. So successful was the Assyrian missionary enterprise, by the end of the twelfth century the Assyrian Church was larger than the Greek Orthodox and Roman Catholic churches combined, and it spanned the Asian continent, from Syria to Mongolia, Korea, China, Japan and the Philippines. When Marco Polo visited China in the thirteenth century, he was astonished to find Assyrian priests in the Chinese royal court, and tens of thousands of Chinese Christians. The Assyrian missionaries had reached China in the sixth century. With only the bible, a cross, and a loaf of bread in hand, these messengers had walked thousands of miles along the old silk road to deliver the word of God. So successful were the missionaries, when Genghis Khan swept through Asia, he brought with him an army over half of which belonged to the Assyrian Church of the East. So successful were the missionaries, the first Mongolian system of writing used the Assyrian alphabet. Armed with the word of God, Assyrians once again transformed the face of the Middle East. In the fourth, fifth, and sixth centuries they began a systematic translation of the Greek body of knowledge into Assyrian. At first they concentrated on the religious works but then quickly moved to science, philosophy and medicine. Socrates, Plato, Aristotle, Galen, and many others were translated into Assyrian, and from Assyrian into Arabic. It is these Arabic translations which the Moors brought with them into Spain, and which the Spaniards translated into Latin and spread throughout Europe, thus igniting the European renaissance. By the sixth century A.D., Assyrians had begun exporting back to Byzantia their own works on science, philosophy and medicine. In the field of medicine, the Bakhteesho Assyrian family produced nine generations of physicians, and founded the great medical school at Gundeshapur. Also in the area of medicine, Hunayn ibn-Ishaq*s textbook on ophthalmology, written in 950 A.D., remained the authoritative source on the subject until 1800 A.D. In the area of philosophy, the Assyrian philosopher Job of Edessa developed a physical theory of the universe, in the Assyrian language, that rivaled Aristotle*s theory, and that sought to replace matter with forces. One of the greatest Assyrian achievements of the fourth century was the founding of the first university in the world. The School of Nisibis had three departments: theology, philosophy and medicine, and became a magnet and center of intellectual development in the Middle East. The statutes of the School of Nisibis, which have been preserved, later became the model upon which the first Italian university was based. When Arabs and Islam swept through the Middle East in 630 A.D., they encountered 600 years of Assyrian Christian civilization, with a rich heritage, a highly developed culture, and advanced learning institutions. It is this civilization which became the foundation of the Arab civilization. But this great Assyrian Christian civilization would come to an end in 1300 A.D. The tax which the Arabs levied on Christians, simply for just being Christian, forced many Assyrians to convert to Islam to avoid the tax; this inexorably drained the community, so that by the time Timurlane the Mongol delivered the final blow in 1300 A.D., by violently destroying most cities in the Middle East, the Assyrian Christian community had dwindled to its core in Assyria, and henceforth the Assyrian Church of the East would not regain its former glory, and the Assyrian language, which had been the lingua franca of the Middle East until 900 A.D., was completely supplanted by Arabic (except amongst the Assyrians). This, from 1300 A.D. until World War One, became the second Assyrian dark age. The Assyrian missionary enterprise, which had been so successful throughout the Asian continent, came to an abrupt end with the coming of Timurlane the Mongol. The indiscriminate destruction leveled by Timurlane against the civilizations he encountered put to a permanent end the Assyrian missionary enterprise. A large segment of the Assyrian population escaped the ravages of Timurlane by fleeing into the Hakkary mountains (present day eastern Turkey); the remaining Assyrians continued to live in their homelands (presently North Iraq and Syria), and Urmi. The four Assyrian communities, over time, begin defining themselves in terms of their church affiliation. The western Assyrians, all of whom belonging to the Syriac Orthodox Church, began identifying themselves as "Jacobites". The remaining communities belonged to the Assyrian Church of the East. After the division of the Church of the East in 1550 A.D., the Chaldean Church of Babylon, a Roman Catholic Uniate, was created, and members of this church began to call themselves Chaldean. By the end of the nineteenth century, these three communities no longer saw themselves as one and the same. For over 6600 years Assyrians lived in their ancestral homeland, but beginning with the Turkish genocide of Assyrians in World War One, which began on April 24, 1915 and claimed 750,000 Assyrian lives (75%) by 1918, Assyrians began moving to the West. Today there are more Assyrians living in the West than in their ancestral homeland, and this exodus has accelerated sharply in the 21st century.